Comic fan Michael Finn has been going to conventions for years getting "3-minute sketches." He'll toss an artist a backing board, and ask him to do a sketch in three minutes, no more. The results are often stunning and surprising. Now, The Hero Initiative has collected Michael's sketches into this great art book, featuring contributions from Neal Adams, Howard Chaykin, Steve McNiven, George Pérez, John Romita Sr. and Jr., Walter Simonson, Michael Turner and MORE! See such faves as Spider-Man, the Hulk, Hellboy, Wolverine, Conan and more, all benefiting The Hero Initiative! Features an original cover by Joe Quesada! Personal time and a rollickin’ 3-minute sketch! Master artist George Pérez will be at the New York Comic Con Feb. 6-8. But YOU can soak up your Pérez magic away from the teeming masses in a relaxed, private environment—and get a George Pérez original all at the same time! And proceeds benefit The Hero Initiative, the charity dedicated to helping comic creators in medical or financial need! Join comic art legend George Perez in a relaxed, private room environment where only 20 fans will be admitted! George's collaborator Bob Wiacek will be on hand as well. You can bring up to five books to be autographed by George (and Bob, so dig out those Brave and Bolds) and CGC will have a Signature Series witness on site if you wish to get autographed books certified by CGC in their Signature Series. PLEASE NOTE: CGC’s Signature Series service is a separate cost you pay direct to CGC. See www.CGCComics.com for details. A portion of proceeds raised from books submitted for the CGC Signature Series from this signing will go towards the Hero Initiative. Best of all, in the tradition of Hero's rollickin' The 3-Minute Sketchbook, George will do a 3-minute sketch of a character of your choice on site! Tickets are available at $100 each with a STRICT limit of two tickets per person! All purchases of quantities greater than two WILL be disqualified, and you may purchase only quantity 1 or quantity 2. This event will take place in a private room at the New York Comic Con at noon on Saturday, February 7, 2009.
WHO: George Pérez, Hero Initiative Board members and artist of JLA/Avengers, Legion of Three Worlds, The Brave and the Bold, Teen Titans, and many, many more of your favorite comics! WHAT: A private appearance with George. Only 20 people will be admitted, maximum two tickets per buyer. Each ticket is good for five signatures and a three-minute sketch! WHY: Because George is a jolly good fella, and he believes in and supports The Hero Initiative! WHERE: The reception will be at The New York Comic Con at the Jacob Javits Convention Center in New York, NY. WHEN: Saturday, February 7, 2009 at high noon! • Please come to the Hero Initiative booth (#1865) at the New York Comic Con by NO later than 11 AM on Saturday, February 7 (Friday is fine, as is earlier on Saturday). Bring your PayPal receipt and photo ID to claim your ticket. See Michael Finn at the booth; he’ll be coordinating the event. • Please return to the Hero Initiative booth (#1865) at the New York Comic Con by NO later than 11:45 AM on Saturday, February 7, and we’ll get this party started, as the kids say! Q: What will George draw on? Do you provide anything? A: George will have pencils, pens, markers and the like, but you must bring your OWN material for him to draw on. We suggest a sketchbook, comic backing board or the like. Remember—it’s a three-minute sketch! Q: Do I need to buy a ticket to get into this here convention thing you keep talking about? A: Yep, and we suggest you check http://nycomiccon.com/ for ticketing and all other convention info. Q: Can George sign ten items? Bless my baby? Do the Funky Chicken with me? Go out for a round of cocktails? Beat up my big brother for me? Sweep out a bar in Freehold, NJ if I have a ticket? A: No, no, no, no, no, and no. Alas and alackaday, we gotta get everyone through in a timely fashion here. Okay, he’ll bless a baby. It works best if you’re Catholic, ’cause George is, too! Q: Is this tax deductible? A: Yes, to the extent allowed by law. The Hero Initiative is a non-profit organization recognized by the federal government under section 501 (c) (3) of the Internal Revenue code. Q: Okay, what’s that mean? A: We cannot legally give tax advice. According to IRS regulations, we cannot determine the value of this donation. That is between you and your accountant. According to the IRS, the amount of deduction is based on the price that a "willing buyer" will pay for your item. Your PayPal receipt doubles as your donation receipt, and will specify when your donation was made and what was paid. Q: Why are you guys so hyped up on this “three minute” deal? 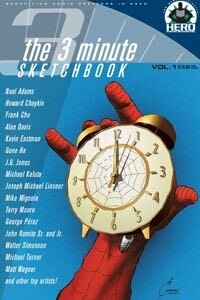 A: ’Cause of The 3-Minute Sketchbook, a great book Hero published that features over 100 sketches by 100 top artists all done in three minutes or less! It’s super-cool, and copies will be available for sale for a mere $10 both at the Hero booth at the con and at the Pérez event. Check it out! This auction is a benefit for The Hero Initiative, the first-ever federally chartered not-for-profit corporation dedicated to helping comic book creators in need. Hero creates a financial safety net for yesterdays' creators who may need emergency medical aid, financial support for essentials of life, and entrée back into paying work. For more information, visit www.HeroInitiative.org or call 818-997-6114. NOTE: The 3-Minute Sketchbook cover shown here is merely representative art, and not part of this auction.